The city of Las Palmas de Gran Canaria, to give it it's full name, is the capital of Gran Canaria, and is also the the joint capital of the Canary Isles (together with Santa Cruz de Tenerife). Las Palmas also has the largest population of any city in the Canary Islands, and surpisingly perhaps, the 9th largest in all of Spain. 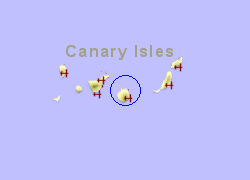 The city is located on a narrowing piece of land on the north east of the island with the port and marina immediately to the east, and a golden sandy beach running down the western edge. The city does of course have all the amenities, culture and architecture you would expect of a Spanish city. There is some lively nightlife, particularly around the port area, and around 5Km of fine andy beaches, ranging in colour from grey to golden. 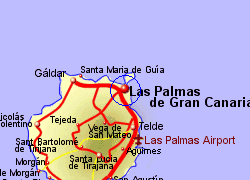 Map of the Las Palmas area. This 1 bedroom house is located in Teror and sleeps 2 people. It has WiFi.